After surrendering their home-ice advantage immediately, via a 3-0 loss in Game 1, the Ducks entered Game 2 with an obvious emphasis on aggression. 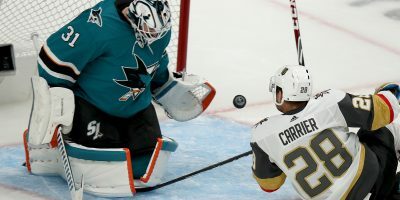 Both with the puck and the pads, Anaheim came rushing out of the dressing room scoring the game’s first goal on its first shot just 40 seconds in while pushing the Sharks‘ physicality, registering five hits in the game’s fist six minutes. San Jose matched both attacks, though, outhitting the Ducks 14-10 and carrying a 2-1 lead into the first intermission. And they never let up, snatching a 3-2 Game 2 victory to take a 2-0 series lead back to San Jose. After being outshot 34-25 in Game 1, the Ducks put a shot not just on net but in it before all the Honda Center seats were filled. It took just 41 seconds for Jakob Silfverberg to give Anaheim the early lead on a wrister from the point. Twenty seconds later, Ondrej Kase and the Ducks put another shot on goal, this one saved by Martin Jones. The answer came quickly from the Sharks, who recorded the next four shots — one on goal — in the next 70 seconds. 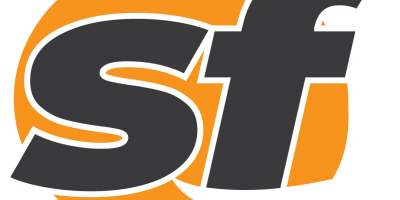 Unintentionally, the Ducks physical aggression opened the flood gates for the San Jose offense. The finned flood began with an impressive splash — a deflection around the back of the goal, off the end wall and collected by Marcus Sorensen just outside the crease and quickly deposited in the back John Gibson‘s net before the Anaheim goalie was able to snap his head back. Despite several hits questioned by the both teams, and several more questioned by the Anaheim crowd, the game’s first whistle didn’t come until six minutes in when both Silfverberg and Evander Kane were sent to the box for roughing. After two minutes of scoreless four-on-four action the Ducks continued along the path physicality and gave San Jose the game’s first man-advantage — a hooking minor to Brandon Montour — with six-and-a-half minutes remaining in the first. 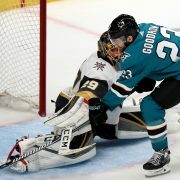 On the heels a 1-for-6 performance on power plays in Game 1, the Sharks, who finished the regular season 15th in the NHL scoring on 20.7 percent of their power play chances, got on the board with their first chance. It wasn’t for lack of effort by the Anaheim penalty kill, however. Evading four Shark shots — two on goal — and a pair of Joe Pavelski face-off wins in the offensive zone, two attempts to clear were denied in the neutral zone by the stick-less right hand of Brent Burns, the second sent to through Kevin Labanc and Pavelski to Logan Couture for the power play score and 2-1 lead. The Ducks, who were on the receiving end of just three power play opportunities in Game 1, going scoreless on those chances, got their first power play goal 81 seconds into their first chance in Game 2 — nearly eight minutes into the second period. The Hampus Lindholm top-shelf wrister served as an answer to Tomas Hertl‘s latest nifty finish 71 seconds into the same period. Following the five goals in less than 28 minutes of game time, Jones and Gibson put the impenetrable walls exchanging 29 saves, including seven in penalty-kill situations — three by the San Jose net-minder and four by his counterpart — over the final 32 minutes. When the final buzzer sounded, it was Gibson who had recorded more saves (35), but Jones (30 saves) who take a second win. 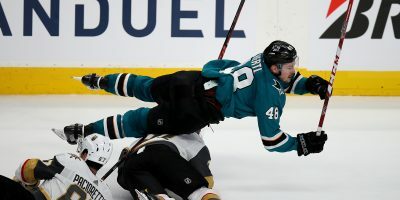 The Sharks look to sink their collective teeth into a commanding 3-0 lead Monday, when the Ducks fly north to San Jose and the SAP Center for Game 3. 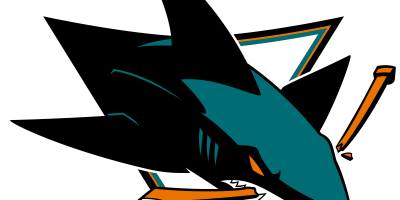 The puck is scheduled to drop at 7:30 p.m.
Center Tomas Hertl was taken to the dressing room after being struck in the face by the puck in the first period. He returned shortly and finished the game. … Following a forecheck by Anaheim defenseman Francois Beauchemin, winger Kevin Labanc was taken to the dressing room six minutes into the first period. He returned to the ice and finished the game. 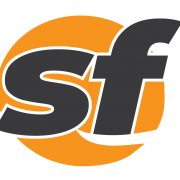 … Ducks’ center and captain Ryan Getzlaf, who missed significant time with a fractured orbital bone in the face, was struck in the face by the puck early in the second period. He returned to the ice and finished the game. 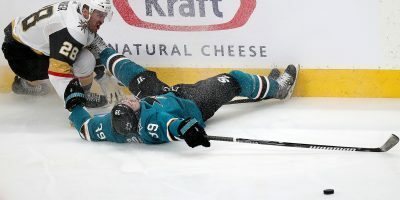 … A hit by Anaheim assistant captain Corey Perry on Melker Karlsson late in the third drew a two-minute minor penalty but appeared to be direct contact the head which would, if deemed necessary by the league, could evoke a suspension.